Commercial foundation repair will stabilize your building and protect your property. If you're looking for an experienced contractor to repair or upgrade your commercial property, Ayers Basement Systems is here to help. We offer complete solutions for commercial foundation repair, concrete leveling, electrical services, and vapor intrusion. Our experts will help you get the right services you need to keep your building protected, stable, and functioning correctly. We provide thorough inspections and recommend the best solutions, and as a Supportworks contractor, we offer industry-leading products and services. If you're interested in any of our commercial services for your property, give us a call today at 1-844-262-2971 or click below to get started. We offer free estimates on all our work in Grand Rapids, Lansing, Kalamazoo and the surrounding areas. 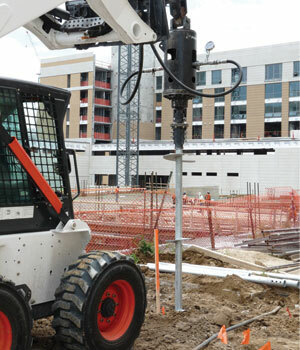 For a new construction with a deep foundation to permanently stabilize sinking or settling foundations. A supplemental support system for crawl space applications. It effectively supports sagging beams and floor joists. PolyLevel® uses high-density polyurethane to stabilize and level concrete slabs and foundations. Shotcrete is a mortar or concrete that is applied as a spray through a high-pressure hose and application nozzle. Get a solution to your electrical problems or upgrade your electrical system. If your commercial property has issues with foundation cracks, uneven concrete, vapor intrusion, or electrical problems, Ayers Basement Systems has the solutions you need. Our complete line of commercial products and services will ensure your property is fully taken care off. Call us today at 1-844-262-2971 or contact us online to get started with a free estimate on any of our services. 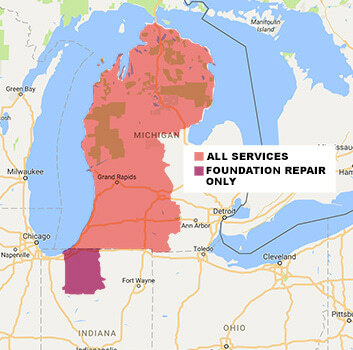 We offer all our work in Lansing, Grand Rapids, Kalamazoo, Muskegon, Battle Creek, Mount Pleasant, Jackson, Niles, Alpena, Traverse City and throughout the surrounding areas.